Golf (three courses within a few minutes), gliding and riding are nearby. 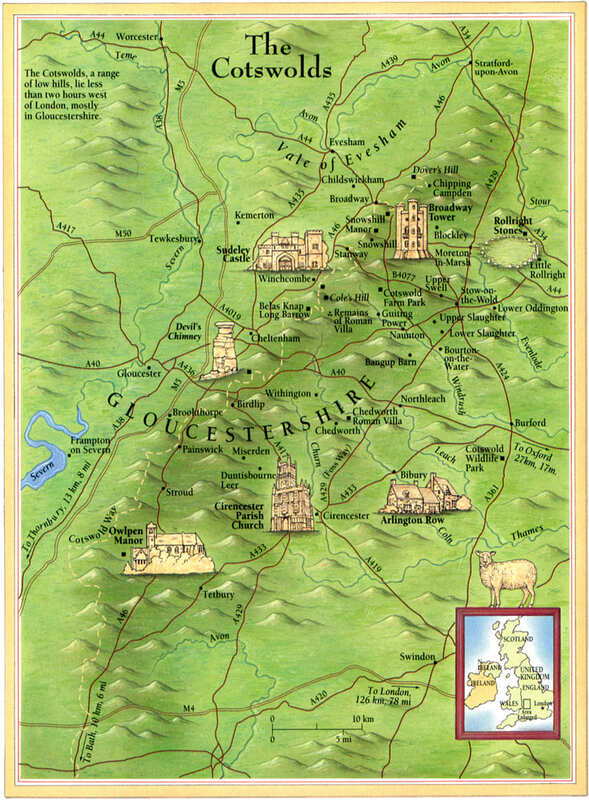 Owlpen is in the 'Royal Triangle', set in the heart of the Cotswold Hills. The historic cities of Bath, Cheltenham and Cirencester are all about 20 miles away, with their wealth of cultural and scenic attractions. Bath, Oxford and Stratford-upon-Avon are popular day excursions. Whether your interest is the famous limestone villages of the Cotswolds, sparkling in honey-coloured stone, and rolling hills, or prehistoric barrows, quiet lanes, antique shops, walking -- from a gentle stroll round the estate trails to a 20-mile trek along the Cotswold Way -- Norman churches, gardens, good food and gastropubs, visiting friends, or more likely a combination of these, the choice is wide and you will barely scratch the surface during your stay. Historic houses, besides Owlpen itself, include Berkeley Castle, Chavenage House, Dyrham Park, Stanway House and Sudeley Castle. Within walking distance is Woodchester Mansion, an unfinished masterpiece of the Victorian age. Newark Park (National Trust), a spectacular early Renaissance hunting lodge sited on the edge of a cliff, is three miles to the south. Tourist attractions include the American Museum at Claverton Manor and the Roman Baths at Bath, Gloucester Cathedral, Westonbirt Arboretum and the Wildfowl Trust at Slimbridge. Gloucestershire is famous for its many gardens. World-famous gardens include Hidcote and Kiftsgate, Miserden Park, Painswick Rococo Garden, Rodmarton Manor, Barnsley House and Westbury-on-Severn. Also Highgrove -- if you can get in. We are the ideal base for the Horse Trials at Badminton and Gatcombe Park, for racing at Cheltenham, and polo at Cirencester and the Beaufort Polo Club. Uley has a village pub and micro-brewery, and the Prema arts centre.